The passive voice is where the action is done to the subject. 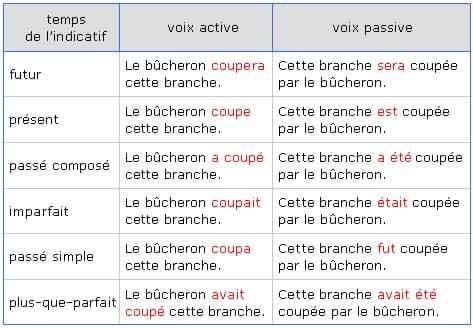 The passive voice in French is constructed just like the passive voice in English, where the conjugated verb is “être”, and the action done is put in past participle form and treated like an adjective. *La ville est entourée par l’ennemi. The village is surrounded by the enemy. *Le garcon est puni par son père. The boy is punished by his father. *Le malade a été guéri par les antibiotiques. The sick person was healed by antibiotics. *La ville est entourée de montagnes. The city is surrounded by mountains. *La discrimination est interdite par la loi. Discrimination is forbidden by the law. *La fenêtre a été cassée par la pierre. The window was broken by the rock. *Le roman a été écrit par Corneille. The novel was written by Corneille. *Une récompense est promise. A reward is promised. *La cigarette est interdite. Cigarettes are forbidden. There are other ways of forming the passive voice, but these are examples of the basics. You are currently reading Passive Voice at French Notes.